Impress your clients with a sparkling clean building by calling A & A Janitorial Services. Our janitorial service provides contracted office cleaning services for buildings throughout the Tri-State area. Contact us in Huntington, West Virginia, for more details about our services. At A & A Janitorial Services, we know that it's important to put your best foot forward at all times and provide you with the high-quality cleaning services you need to ensure favorable first impressions on every client that walks in. Call our cleaning company to learn more about our contract cleaning or to ask about emergency services after a storm. NOW Offering Residential Cleaning in the Tri State Area! Your home is your escape, your space, your area of relaxation. Give yourself the gift of time and let A & A clean your home the way you want it cleaned. After spending a hectic day at the office, on the errand trail or at school, A & A is the smart choice for professional house cleaning. Our cleaning service is available 7 days a week and will come to your business on the days and times of your choice to keep your building clean without disrupting operations. Plus, our contracts are flexible and allow you to cancel with a 30 day notice if you are not satisfied with our service because we stand behind all of our work. The cleaning specialists at A & A Janitorial Services have more than 28 years of professional cleaning experience and started this business 11 years ago to provide you with the superior quality cleaning you deserve. We have a dedicated staff that is drug tested and background checked along with the competitive prices you've been looking for. 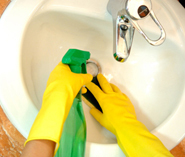 Call our janitorial service at (866) 769-4075 to experience our world-class cleaning services.